We’ve been making good progress on our fictitious site … but is a web site really a web site when it contains only one page? Just as the question, “Can you have a sentence with just one word?” can be answered with a one-word sentence (“Yes”), so too can the question about our one-page web site. But you didn’t buy this book to learn how to create a one-page web site, did you? Let’s take a look at how we can split the page we’ve been working on into separate entities, and how these pages relate to each other. First, let’s just ensure that your page is in good shape before we go forward. The page should reflect the markup shown in the last large block presented in the previous section (after we added the <div> tags). If not, go to the code archive and grab the version that contains the divs (/chapter2/website_files/06_adding_structure_with_divs/index.html). Save it as index.html in your web site’s folder (if you see a prompt that asks whether you want to overwrite the existing file, click Yes). Click on the index.html icon in Windows Explorer or Finder. To copy the file, select Edit > Copy. To paste a copy in the same location, select Edit > Paste. Repeat the process once more. You should now have three HTML files in the folder that holds your web site files. The index.html file should stay as it is for the time being, but take a moment to rename the other two in lowercase only. Select each file in turn, choosing File > Rename, if you’re using Windows; Mac users, simply select the file by clicking on it, then hit Return to edit the filename. Rename one file as contact.html. Rename the other one as about.html. Tip: Where’s My File Extension? In the Advanced Settings group, make sure that Hide extensions for known file types does not have a tick next to it. 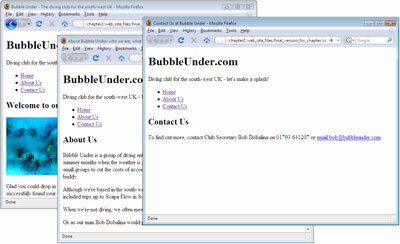 We have three identical copies of our XHTML page. Now, we need to edit the content of these pages so that each page includes only the content that’s relevant to that page. To open an existing file in Notepad, select File > Open…, and in the window that appears, change Files of type to All Files. Now, when you go to your Web folder, you’ll see that all the files in that folder are available for opening. Opening a file in TextEdit is a similar process. Select File > Open… to open a file, but make sure that Ignore rich text commands is checked. Delete the “About Us” and “Contact Us” sections (both the headings and the paragraphs that follow them), ensuring that the rest of the markup remains untouched. Be careful not to delete the <div> and </div> tags that enclose the body content. Delete the introductory spiel (the level two heading and associated paragraphs, including the image) and remove the “Contact Us” section (including the heading and paragraphs). Change the level three heading <h3>About Us</h3> to a level two heading. In the process of editing our original homepage, we’ve lost one of our heading levels. Previously, the “About Us” and “Contact Us” headings were marked up as level three headings that sat under the level two “Welcome” heading. It’s not good practice to skip heading levels — an h2 following h1 is preferable to an h3 following an h1. Change the level three heading to a level two heading, as you did for about.html. If everything has gone to plan, you should have three files named index.html, about.html, and contact.html. 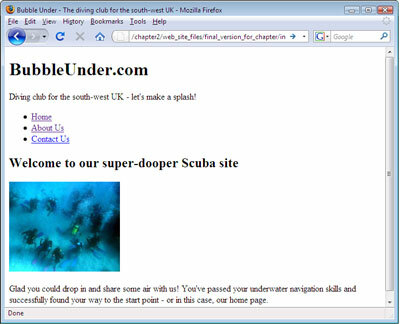 alt="A circle of divers practice their skills"
We’ve successfully created a three-page web site, but there’s a small problem: there are no links between the pages. Try for yourself: open index.html in a web browser and take a look at the display. How will you get from one page to another? The a element might not be intuitive (it stands for “anchor”), but you’ll get to know this one very quickly: it’s what the Web is built on. The a element contains the link text that will be clicked (which, by default, appears on the screen as blue, underlined text). The href attribute refers to the URL to which you’re linking (be that a file stored locally on your computer, or a page on a live web site). Unfortunately, again, href is not immediately memorable (it stands for “hypertext reference”), but you’ll use it so often that you’ll soon remember it. The link text — the words inside the anchor element, which appear underlined on the screen — should be a neat summary of that link’s purpose (for example, email bob@bubbleunder.com). All too often, you’ll see people asking you to “Click here to submit an image,” or “Click here to notify us of your change of address” when "Submit an image,” or “Notify us of your change of address” more than suffices. Never use “Click here” links — it really is bad linking practice and is discouraged for usability and accessibility reasons. We’ll place all of this inside a div, so we can quickly and easily see what this block of XHTML represents. Now, we just need to paste this markup into an appropriate place on each of our pages. A good position would be just after the header has finished, before the main body content starts. <p>Glad you could drop in and share some air with us! You should now be looking at a page like the one shown below. Add the block of links to contact.html and about.html, then try clicking on the links that you’ve just added. It should be possible to flick between all three pages. 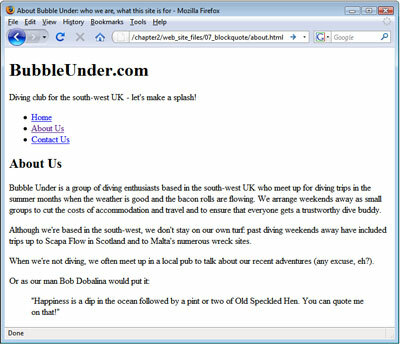 This is a landmark: you’re now the creator of a working, navigable web site. Let’s now discuss a few more XHTML elements that you can add to your pages. Happiness is a dip in the ocean followed by a pint or two of Old Speckled Hen. You can quote me on that! The quotation can contain as many paragraphs as you like, as long as each one starts and ends correctly, and the opening <blockquote> tag is closed off properly. In most browsers, your use of blockquote will see the quoted text indented in the page display. This effect can be overridden if it’s not to your taste, but that’s something we’ll cover in a later chapter. On the flip side, you should never use the blockquote element for the purposes of indenting text. This is very poor form. Only use blockquote for its intended purpose: to present a quotation. There are other, better ways to create visual indentations, namely CSS. We’re not using the cite element (or the cite attribute) in the diving web site, but you may find them useful in your own web site projects. We mentioned the em element earlier in this chapter. It’s a fairly straightforward element to remember. If you can imagine yourself adding some kind of inflection as you say a word, then emphasis is probably what you need. If you’re looking to strike a slightly more forceful tone, then you should consider “going in strong“. By default, adding em will style text in italics, while using strong makes the text bold. You can combine the two if you want, but usually, one or the other will suffice. The examples below should help you understand what these elements are used for. The figure below shows how they appear in the browser. The chapter’s almost at an end, so why take a break? Well, this is just an excuse for a headline pun. We have one more element to look at: the break element. It’s all too easy to resort to using multiple breaks in a web page to achieve a visual effect. If you find yourself doing this, something’s wrong: you almost certainly need to look for a more suitable technique (we’ll look at how this visual effect should be achieved later). Be careful in your use of br. Note that br is an empty element, just like meta and img, so in XHTML it’s written as <br/>. Wow — what a great start we’ve made. In this chapter, you’ve built a single web page gradually into three linked pages. You’ve become familiar with the most commonly used XHTML tags, as well as some of the less common ones that you can apply to your web pages. But, somehow, despite all your efforts, the web pages are still looking a little on the bland side. We’re going to fix that very soon: in the next chapter, we’ll start to add some splashes of color, and make the site look a little more like a fun diving site and less like a boring old Word document.